I went to the mall this weekend. They were playing Christmas carols. I spent my ride home singing “I’ll Be Home for Christmas” without realizing what was going on. They inadvertently hijacked my holiday spirit. Crafty. Why do we have to rush through this holiday season? I still have my jack o’lantern on the porch. Chill. We’ve got time. Let’s not rush things. I’ve still got pumpkin recipes for you! I am not ready to switch to egg nog (least of all because it’s awful). Fall has barely arrived. I just want to relish in cinnamon and cloves and all that this season has to offer before I am bombarded by peppermint, blow-up snowmen and Mall Santas. We will get there. All in due time. Please take a beat with me and breathe. Now, make this pumpkin cake. It’s light and wonderful. It’s a great vehicle for whipped cream. It’s fall. 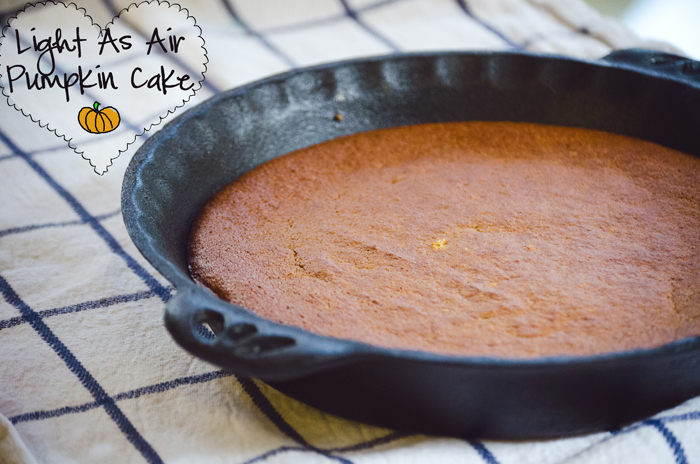 I know I have already brought you one pumpkin cake recipe this season… but, why not have two? The more the merrier. In a food processor, mix your wet ingredients: pumpkin, maple syrup, and eggs. Mix until thoroughly combined. Two minutes or so. Pulse your dry ingredients into the wet ingredients until everything is mixed together well. Pour your batter into a greased baking dish. I used a 9 inch cast iron pie pan. Bake for 30-35 minutes. Your cake will be nicely browned and a fork should come out cleanly from the center. Serve as is, or slather with whipped cream!